There are charter flights to Puerto Vallarta from various gateway cities throughout the world during the high season November through May. You may find some good values. NEED A TRAVEL AGENT? WE RECOMMEND HAZEL BOONE. If you need the services of a good travel agent, feel free to contact our friend and reliable travel resource. 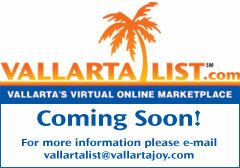 Hazel is a cruise and spa specialist and will be glad to help you find and book the best airfares to Vallarta as well.